If you are an old bebo.com user, then you may have had a heck of a time trying to keep your account content when Bebo was sold to AOL (America Online) and then bought back by the original creators. During the transition from Bebo Inc., to AOL and back again, many users found it difficult to retrieve their uploaded blogs, photos, and posts. If you are or were a diehard bebo.com user and logged in regularly to keep your account active, you probably want to maintain and save all your old online content. Due to the transition to and from AOL, some users stopped visiting the site regularly. Consequentially, their accounts have been disabled and removed from the Bebo archive. If your account was still active prior to the Bebo transformation into a social messaging application, chances are you will be able to retrieve all your lost blogs, photos, and posts. To access the old content, you first must download the Bebo application from either the Google Play Store or Apple App Store. After you have installed this application, launch Bebo and follow the steps to create a new account. Do not use the same credentials with your new account as the old ones you used on bebo.com. Reports of old accounts being deactivated have been noted, and some additional users have lost their archived material due to the same username/password combination causing confusion on the Bebo application’s servers. After you have created your new account, you can send a hashtag message to anyone as follows: #oldphotos. Instantly a window will pop-up asking for your old Bebo account information. 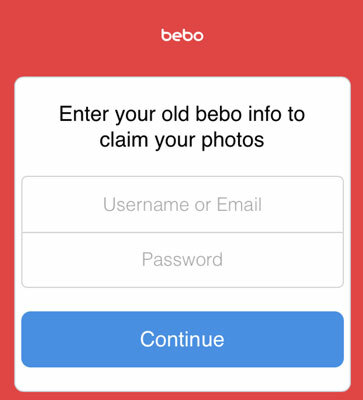 Enter your username or e-mail and password to the old Bebo account and press continue. Make sure you are putting in your old bebo.com account info and not the new info you just created! E-mail then will be sent to you via the e-mail associated with your account containing links to all your old bebo.com content. Bebo Inc., claims #oldphotos doesn’t work for just old photos but also for old posts and blogs as well and is trying to rectify the issues caused by AOL. If you are one of the lucky ones and get to keep your archived content, great! Otherwise, be prepared to say goodbye to the content in case it is lost forever, and perhaps next time consider a hard copy backup directly on your computer, external hard drive, or memory card for safe keeping. Good Luck!